It's free, fun and just the right boost to help you follow through on everything you want to get done in the final months of 2013. Monday, Sept. 23rd marks the beginning of the last 100 days of the year. It's been proven time and again that we are more likely to accomplish a goal or a challenge when there is accountability and support built into our plans. That's why sharing stuff like this has helped me stick with self-imposed challenges. The 100 Day Challenge will be your accountability and support to help you meet your goals and challenges and finish off the year with a big win! We may have started out the year with good intentions and our trusty list of things to do, to try, places to go or even people to keep in touch with…and then…life. The momentum of the new year has long worn off and the next new year is still over 3 months away. Why wait to kickstart our lives again? Finish off this year feeling excellent because you accomplished all the things you set out to do. Being productive, following through and having something to show for it definitely brings you a sense of satisfaction, integrity and wholeness. 2) Create a list of 10 things you want to get done or work on. https://www.facebook.com/raksgina. This will give you access to the Forum tab on the page. 4) Post your list on either the 100 Day Challenge Forum tab on the Facebook page (mentioned above in #3) or simply post it on the page. Either place you post is public although the Forum will tend to attract only participants of the challenge. 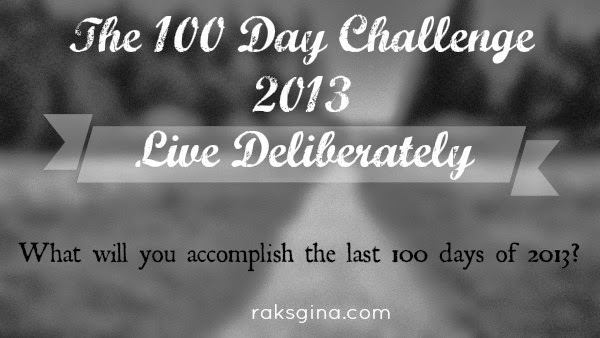 5) Share your progress or and support your fellow 100 Day challengers on the forum. That's it! End 2013 with no excuses, no regrets and no apologies. Can you imagine the energy you will bring to your 2014?! You get support, accountability, encouragement, resources that I'll share with you along the way and community. And of course you'll get stuff done! What makes the final 100 days so special? With the busy time of year coming up it's a good time to bring your focus back to important goals in your life. 100 days gives you ample time to actually get things done, not feel rushed, see results and feel successful. Ending the year right sets you up to start the new one with a great mindset. Anything that you will feel proud of finally crossing off your list. You can include big jobs, little and in between things. You can list health goals, dance goals, projects, relationship goals, crafts, dreams or even those pesky little jobs around the house that you keep putting off. Wasn't the list longer last year? Yes. Last year we did 12 things. As in "the last 12 things of 2012". If you're feeling ambitious you can certainly go for 13 since it's 2013. I am choosing to go with 10 as I'm concentrating on quality rather than quantity. Do I have to post my list? Yes. Time and again it has been demonstrated that accountability and support are the two missing ingredients to getting things done. What a great opportunity to partake in building such a supportive community from the ground up. Why do I have to "Like" your Facebook Fan Page? As of now that is the only way to access the forum where we'll be sharing our lists and progress. In the next months I may have a different way of sharing available but as of now that is where you'll find the action. I don't do Facebook but I really want to do this. Can I? Yes. But I highly encourage you to participate via facebook as that is where the sharing, support and community will be. But if you still feel strongly against it you can certainly still play along. 2. Send me you list. Or at the very least share it with someone. THIS IS KEY. Accountability really kicks in when you put your intentions out there. 3. I will keep you in the loop of things via email.